We will be celebrating the fact that fifty years ago Jan Tinbergen received the Nobel Memorial Prize in Economic Sciences (commonly referred to as the Nobel Prize). With his knowledge and motivation he meant a lot to society in his days. But what about now? It is time for reflection and for scrutinizing the Netherlands of today and of the future. 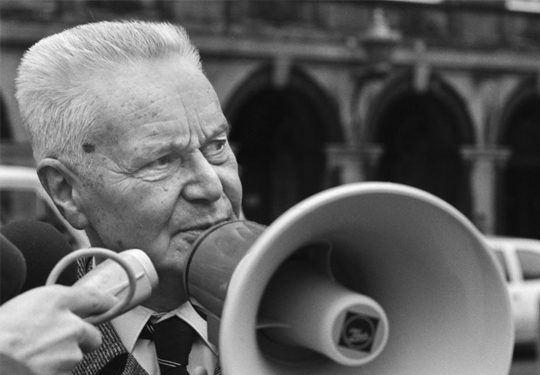 With this project, we underline the importance of economic thought based on Jan Tinbergen’s life. Why is the Netherlands governed as it is? We aim to hold both a social and a policy debate as to how the Netherlands’ socio-economic management is organized. This way, we aim to generate knowledge and arguments as a starting point for debating this matter in the Netherlands. You will find everything about the Tinbergen Year 2019 on this website. Here you will find a summary of all the activities, in addition to a brief biography of Jan Tinbergen and exclusive visual material. We will also make reports on all the activities afterwards. In order to remain informed, please subscribe to the newsletter at the bottom of this page. The project is carried out by ESB. The Tinbergen Today partners are contributing to the project by organizing various activities. If you would also like to contribute to this project as a partner, please contact Sobana Sheikh Rashid via info@tinbergentoday.nl.